It is with great humbleness and an appeal to the spirit of forgiveness that I approach this post. I have shamed my family and my friends with a terrible first BBQ here in Japan. It was, in all ways, a culinary disaster. My backyard Brooklyn barbecues have always been the stuff of legend. It was something I excelled in and all my friends and family would agree that I was the King of Warm Weather Outdoor Eating. I always overdid it, providing an array of smoked meats (ribs, brisket, pork shoulder cooked low and slow over white oak for 14 hours), grilled meats (steaks, burgers, sausage, lamb, satays), veggies (potato salad, tomatoes, grilled spring onions and zucchini, green salads) and tons of beer, wine and hard liquor. My theory was always make too much and never run out of alcohol. My food was always on point — my ribs, in particular, were better (in my opinion) than any famous BBQ spot in the country: smoky-sweet, tender, spicy and deeply flavorful. BBQs were my pride and joy — I planned them out for weeks in advance and took 2-3 days to merely prep (shopping, marinating, chopping, etc. ). I figured that, no matter what, no matter where I resided, I would always be a BBQ master. Things went awry right from the start. I should have realized that when dealing with new circumstances, stick with simplicity. I should also have realized that my wife’s friends (with whom we would BBQ) would have wanted an easily recognizable American BBQ: Hamburgers, hot dogs, thick steak. I did not follow these obvious signals and hit the meat section of our local supermarket doomed for failure. My first problem is that meat is butchered very differently in Japan than in the US and I cannot understand what cuts of meat I am dealing with. The week previous, I had made Carne Asada tacos that were delicious. I had found a chunk of beef that I guessed (correctly) was brisket. I cut it into 1/4 slices against the grain and marinated it in orange juice, garlic, onions, salt and chopped up pineapple. It was brilliant and vibrant. I could not find that same brisket, so made some guess-work with a large chunk of beef, exported from Australia. (Japanese supermarkets, I have found, often have limited-run specials meaning that you are not guaranteed to find the same products on a subsequent visit). I checked the steaks, but the larger, thicker cuts were of wildly expensive Kobe beef; the cheaper steaks were thinner and vaguely suspect. I got some New Zealand lamb chops, but owing to my ignorance of the metric system, ended up with 6 chops as opposed to the 8 I thought I was getting. 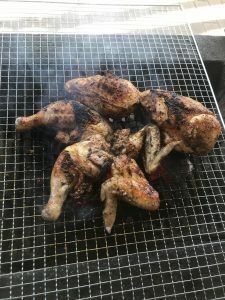 In Brooklyn, I often broke down a whole chicken, stuffed herbs and garlic under the skin, rubbed it with olive oil, salt, pepper and lemon and grilled it over very hot coals (carefully moving the pieces to cooler spots on the grill to avoid burning). Bone-in chicken is very rare in Japan, so when I saw a whole chicken, I got excited. So, 3 lbs of Carne Asada, a whole big chicken, a package of hot dogs and a treat of lamb chops — I thought that would be more than enough meet for 3 adults, 2 boys and 2 girls who don’t eat a lot. I also made a HUGE vat of vinegared potato salad with kielbasa and got a heap of juicy, ripe tomatoes. The day of the BBQ got off to a hectic start. I worked the night before and got home at five am, so I eschewed sleep in favor of prep. But, a no-sleep, beer-adled prep is not the best kind. We left for the park at 8:30 in the morning and I found that my wife’s friend’s husband was to join us. I wondered if we had enough food. 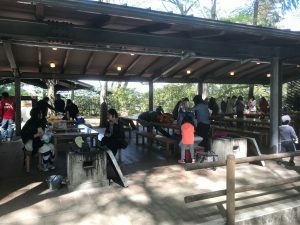 The BBQ spot was located in the Chiba prefecture, about an hour and a half away. I have never seen a park like this in my life. It was carved out of what seemed to be a manufacturing and farm district — maybe two acres of tall trees, camp sites and an extensive array of obstacle courses and zip lines. The experience is quite structured — you reserve a parking space and a BBQ area in advance. There are also cabins for rent and spaces to pitch a tent (I am guessing you have to reserve those as well.) The BBQ spaces are in a large covered space ringed by grills and decked out with picnic tables — an accompanying prep area with sinks adjoins each “Cook Station.” There are maybe 6 of these spaces in the park, filled with about 60 or so people each…so maybe 360 cooking, hundreds of more in the picnic spaces and even more people in the park at large. A whole heap of folks in a fairly small area. Each grill comes with a bucket of charcoal and an accelerant. Japanese charcoal or binchō-tan is new to me. It is a very expensive and well crafted lump-style charcoal — it burns very cleanly for a very long time. It does not however, burn hot, as I was soon to learn. I attempted to light the charcoal, making a little tower around the accelerant as advised in an illustration glued to our table. My tower was shoddy. The wooden house that the lazy pig built. I frantically waved a fan to spark the heat, as I watched the people to the right and left of me create perfect towers that bloomed with flame. When I finally got some heat going I laid out the grill and took out my Carne Asada…Immeiditely I saw I had a major problem. At first I thought it was the heat…nothing was searing; so I fanned and fanned the charcoal. Nothing. I then realized that the mysterious and pricey cut of meat I bought had simply disintegrated in the cirtuisy marinade — the acidic enzymes had broken down the meat into an inedible mush. There was nothing to do but apologize. I then shifted to my lamb chops. They were gorgeous little guys which I had rubbed with rosemary, garlic, salt, pepper, lemon and olive oil. Onto the grill they went and again, I failed to hear that immediate sizzle…I lowered the grill and frantically fanned the coals. Lamb chops on a grill are amazing when crusty with sear while pink in the middle. I was barely getting any sear and was fearful of overcooking. When I figured they were done I handed the six tiny chops to 7 hungry people and it was an almost comical moment. I felt like the most miserly chef of all as I watched my family and guests sneak hungry glances to the grill to our right which loaded up with giant portion of Yaki Soba (fried noodles that they augmented with cabbage, thin slices of pork belly, onions and cabbage) and the grill to our left which was sizzling with thin sliced beef and spring onion. Due to my previous difficulties I knew that my chicken was going to take a while. So, I was glad to see that the park had a small, shallow pond stocked with small trout. You could rent a fishing pole and for $5 a fish have them grilled. 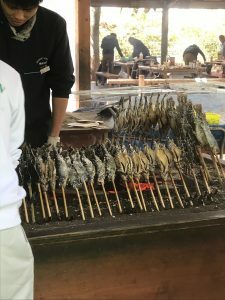 The kids jumped on the chance and quickly pulled out 8 trout, which were rubbed with salt, impaled with a skewer and grilled at an angle over charcoal. They were delicious, although I shudder to think where the water was coming from. By this point, the atmosphere in our cooking shed was becoming more rambunctious. It was only noon, but at least one table was so deep into their drinking that half of their party lay face down, blacked out drunk, the other half doing a lot of crotch grabbing and getting perilously close to actual physical fighting. I took some cultural pleasure that even in civilized Japan, the trashier element of society liked to come out and behave like barbarians at a BBQ. The other tables, noshed happily on tiny fish, skewered tofu, grilled rice balls, udon, and thinly sliced pork, chicken and beef. My whole chicken, cut into pieces, was getting a lot of looks. When it was finally done, my chicken was fine. Not great. Just okay. But I had learned a serious lesson. Binchō-tan is a sensitive, high performance charcoal, perfect for highly detailed cooking where you need a formidable amount of control. As such it is perfect for yakitori where the meat is cut into small pieces and held close to the coals; a fan can “turn up the temperature” of the coals and also reduce them. Perfect for yakiniku as well, which is small and controlled. For larger BBQs, larger cuts of meats, it is not so helpful and really not very flavorful as it is almost odorless. This is why everyone else was using very thinly sliced meats or using the charcoal only as a heat source. In the end my BBQ was a flop and despite the politeness of our friends, I knew I had failed. It turns out that, even in a realm I thought I had mastered, I have so so much to learn about living here. After six months I am an utter novice, a baby otter just barely treading water. And, like binchō-tan, I am a sensitive instrument and this failure has me feeling out of sorts. Just a minor setback! But, it sounds like you need to source hardwood charcoal & a Weber! Not to mention raise some chickens (and perhaps a pig or two? ).